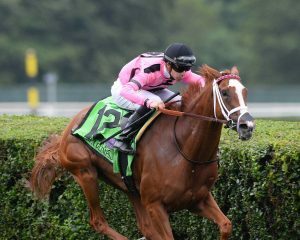 Catch a Glimpse Continues Winning Streak In Belmont Oaks: Catch a Glimpse held off a late challenge from Time and Motion to keep her winning streak intact in capturing Saturday’s Grade 1, $1 million Belmont Oaks Invitational for 3-year-old fillies on Stars & Stripes Day at Belmont Park. The Mark Casse-trained bay filly set the pace and fended off Time and Motion’s stretch run for a half-length victory on the firm turf. By taking the 38th edition of the Belmont Oaks, Catch a Glimpse clinched a spot in the Grade 1, $2 million Breeders’ Cup Filly & Mare Turf Division in November at Santa Anita Park. Her winning time for the 1 ¼-mile race was 1:59.87 in the longest race of her career. It was the eighth consecutive victory for Catch a Glimpse, who is undefeated in seven graded stakes start, including two Grade 1 wins. 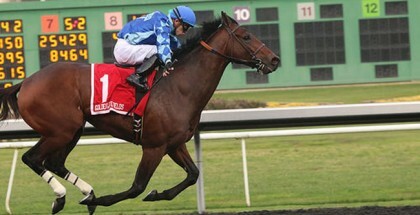 Jockey Florent Geroux has won all seven of his starts aboard Catch a Glimpse, including a victory in the 2015 Grade 1 Breeders’ Cup Juvenile Fillies Turf. Catch a Glimpse, the 3-1 second choice, led a field of 13 in posting an opening quarter-mile in 22.28 seconds, the half in 49.36, three-quarters in 1:13.87 and a mile in 1:36.70. Owned in partnership by Gary Barber, Michael James Ambler and Windways Farm, Catch a Glimpse returned $8.80 for a $2 win wager and improved her career earnings to $1,748,052. 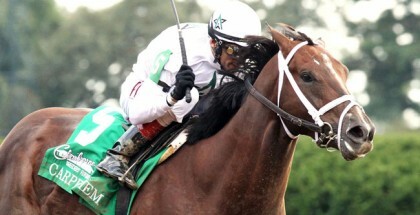 “She’ll definitely go up to Saratoga to train; I’m not sure what her next race will be. It’s always been race-to-race with her,” Casse said. Time and Motion, trained by Jimmy Toner, moved from fifth at the one-mile mark to just a half-length behind Catch a Glimpse entering the stretch. Hall of Fame jockey John Velazquez tried to move her on the outside, but Catch a Glimpse fended off the charge. Coolmore, the Irish-bred chestnut filly for trainer Aidan O’Brien, stayed near the pace-setters before settling for third in her North American debut. Completing the order of finish was Pricedtoperfection, Harmonize, Auntie Joy, Last Waltz, Noble Beauty, Decked Out, Magnanime, Secure Access and Land Over Sea. O’Brien’s Ballydoyle, who was the 2-1 favorite and winner of the prestigious Group 1 One Thousand Guineas Stakes in May at Newmarket, fell back to 10th place at the quarter-mile mark and never regrouped, finishing last.